In Nougat, there used to be a per-app option to control which apps could override Do Not Disturb. In Oreo, I only see the Low/Medium/High/Urgent options, none of which say that they override Do Not Disturb. Is there still a way to do this for Oreo apps? If so, how? It looks like that's only there for legacy apps, not ones that target Oreo and use its new notification channels. Is that so? Can you quote an example app? Chrome is one such app. I see "Allow notification dot" and then a bunch of categories, none of which contain that option. How to get USB file transfer working on Oreo 8.1? 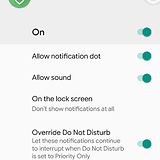 What does "messages" mean in the Priority Only settings in Do Not Disturb? How to Block All App Notifications but Allow Phone Calls?